Gifts for Woodworkers and DIYers are a hot topic this time of year and I’m going to help you out today. So when a loved one asks you for your woodworking Christmas gifts list, you just send them this link and say “go crazy”. Boom, done. And if you’re the buyer, then know I personally own all these tools and use them in my shop. This isn’t a list of things I think look cool. 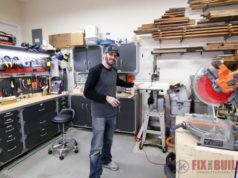 It’s a list I’ve made from my own experience in the shop and these ideas for gifts for woodworkers are sure to help you find some gems for your special woodworker or DIY enthusiast. Of course different gift givers need different price ranges. No worries. 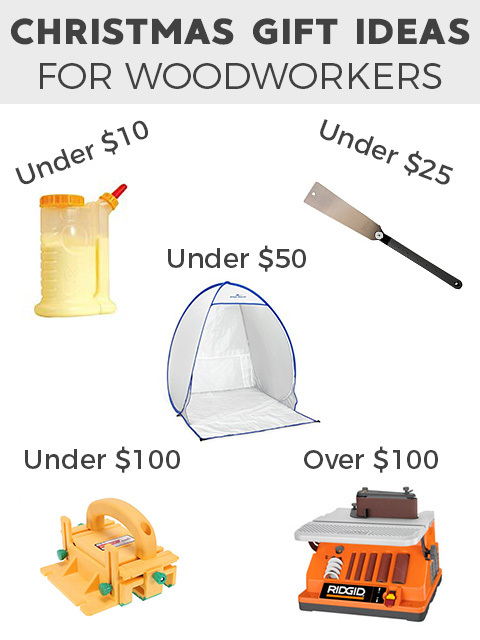 I’ve broken the gifts for woodworkers list down into 5 categories: Under $10 (Stocking Stuffers), Under $25 (Small Gifts), Under $50 (The Sweet Spot), Under $100 (Now We’re Talking), and Over $100 (Makin’ it Rain). Without further ado let’s get to the sweet woodworking gift ideas! There are some great inexpensive gifts for a woodworker in this group and at under $10 you can give several of them to that special woodworker, or share the wealth with a slew of your favorite craftsmen! The Rockler Glue Brush touches almost all my projects. It spreads glue well and being silicone the clean up is a breeze. It’s one of the great small woodworking Christmas gifts. A flashlight like the UltraFire Mini might seem odd on a gifts for woodworkers list, but just remember, woodworkers love searching for great deals on wood, tools, and whatever. And a pocket size light is perfect when jumping in that dumpster looking for salvaged wood. If you’ve ever sprayed more than one can of spray paint at a time or even spray lacquer or polyurethane than you’ve gotten those hand cramps and that indention in your finger. No longer! This Comfort Spray Paint Grip makes spraying any aerosol can a breeze and gives you the feel of a real HVLP sprayer. Highly recommend this woodworker gift! 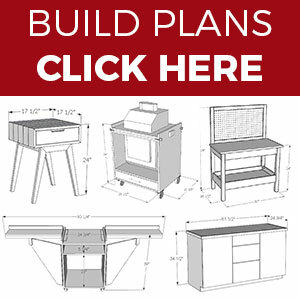 I’d be remiss if I didn’t mention that you can also pickup any of my project build plans for under $10. 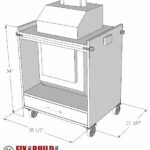 My most popular builds are the Flip Top Tool Stand, Mobile Miter Saw Stand, and the Shoe Storage Bench. What’s better than woodworking gift ideas that will keep giving back in the shop!?! Okay, we’ve stepped up the ladder a wee bit and there are some great finds under $25. Check out these gifts for woodworkers that will surely brighten their day. 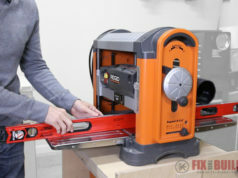 My number one pick in the woodworking gift ideas under $25 group is a Flush Cut Saw. These come in handy for so many different applications when trying to trim dowels or long joints or even just standard crosscutting. This one is my favorite and it might fluctuate above $25 sometimes on Amazon, but here is another saw that is cheaper if you need to hit that budget. 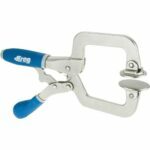 One of the great all purpose clamps I have is this Kreg Face Clamp. If you use pocket hole joinery then you need one of these…period. And if you want to spend a little more you can get the auto adjusting one or really go all out and get the larger auto adjusting one. Who doesn’t like Christmas cookies? Well, you can’t eat these, but the Bench Cookies are awesome for holding workpieces in place while you sand, rout, or cut them. I use mine all the time. This one is a new item on my gifts for woodworkers list, the Cabinet Hardware Jig from Kreg. 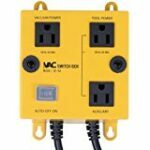 Basically if your woodworker is going to be mounting any kind of drawer pulls, knobs or handles then they can use this. It makes repeatable mounting of cabinet hardware a breeze. The Grr-Rip Block is a safety device that makes cutting on the tablesaw, jointer, or bandsaw so much safer. This guy keeps your fingers away from the blades and grips the work like crazy. I use this one on my jointer the most. 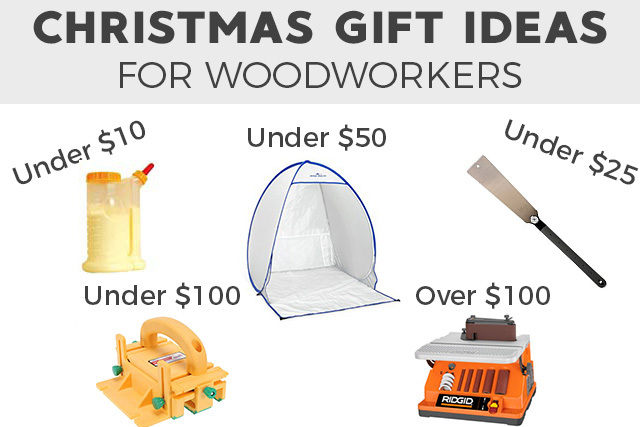 It seems like $50 is a sweet spot for gifts for woodworkers. It’s a great level to find a gift that is little more than a stocking stuffer but still won’t break the bank. Your woodworker will love these Christmas gifts! The Kreg R3 is my top pick for woodworking gift ideas under $50. It’s a great introductory tool to get into making pocket hole joinery. You can clamp it or screw it to almost any surface and be making pocket holes in a snap. If you can’t go for the K4 system then the R3 is the way to go. Gluing up and clamping mitered joints on frames, boxes, etc. is always a pain. You have to get the pressure just right or things move and slip. But one day I found out about this web clamp and my mitered glue ups have been better ever since. It’s one of those woodworking tools that is the perfect match for a specific job. These woodworking Christmas gifts are a great companion to go with the comfort spray paint grip. 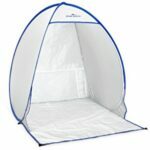 It’s a pop up spray shelter you can setup in your shop for small spraying jobs (paint or clear finishes) and it will help keep the over spray from getting everywhere. It also folds up into a smaller bag for storage. There is also a medium sized version that is still under $50. This is a pretty cool accessory that will help woodworkers keep dust down in their shops. It’s an iVac Automated Vacuum Switch. I use this exact switch on my Mobile Miter Saw Stand and it works by triggering a shop vac to turn on when the tool is in use then turn off 2 seconds after the tool turns off. Automated dust collection means they’ll actually use it! A set of Forstner Bits is going to open up a lot of new things for you as a woodworker. These bits can make flat bottomed holes and are also great at doing larger holes over 1/2″ that drill bit can’t take care of. I seem to use my forstner bit set all the time. We’re getting into some serious tools in the gifts for woodworkers under $100 group. Any woodworker would have a huge smile opening one of these gifts. 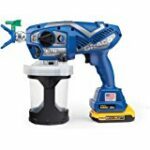 My top pick for woodworking gift ideas under $100 is the Kreg K4. 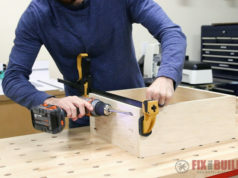 If you are going to use pocket hole joinery (one of the fastest and easiest joinery methods), then a Kreg K4 Jig is going to take you to the next level. It’s head and shoulders above the cheaper Mini and R3 and allows you to quickly clamp, drill, and change workpieces. The RIDGID Compact Router is one of my favorite little handheld tools. It’s excellent for putting roundovers on projects and other small router work. And here is a quality set of router bits if they need some to get started. The Microjig Grr-Ripper is the big brother to the Grr-Rip Block. It’s specifically designed for use on the table saw and makes cutting much safer. I use one every time I’m cutting small pieces and my comfort level is so much higher. You can go for the GR-100 or the GR-200 with some extra features. You’ll see a lot of Kreg products on this list because I love them and use them all the time. The Accu-Cut track is a newer addition to my arsenal and it’s a very affordable track saw alternative. This track pairs up with any circular saw to give you guided cuts to break down plywood or cut large glue ups to size. It’s been a great adding to my woodworking toolkit. These are probably at the top of the list for “Best way to make Sanding Fun”. 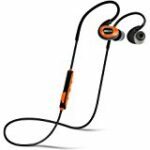 Wearing a pair of Iso Tunes Bluetooth Earbuds will protect your ears, take phone calls, and let you listen to your favorite music or podcasts (like Made For Profit)! The sky is the limit for the ones you love, so here are a few gifts for woodworkers to consider if you are trying to make it rain woodworking goodness. My top pick in the woodworking gift ideas over $100 group is the RIDGID Oscillating Spindle Sander. Words can’t even describe how much I love this machine. 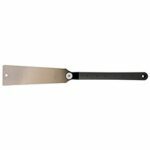 It makes rounding corners and flattening small projects an absolute breeze. 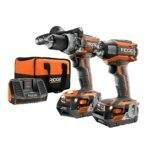 If you need a drill and driver combo, then this RIDGID 18V Brushless Drill/Driver Combo is a great choice. I have these with the Lifetime Service Agreement you get free batteries for life after you register. Just one of the reasons why I’m a huge fan of RIDGID. Sharpening chisels, plane blades, and other cutting tools is always a chore. Not with the Worksharp 3000! 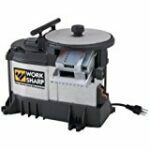 This sharpening system makes sharpening your blades a breeze. I’ve had mine for many years and it works great! And for the ultimate gift for a budding woodworker, the RIDGID Gen5X 5 pc Combo Kit. This kit gets you a Drill/Driver Combo, a Reciprocating Saw, a Circular Saw and a LED flashlight all in on amazing kit. It’s a hefty tool kit that will power your special pro for years to come. This new Graco Cordless Sprayer has taken the Intagram Woodworking world by storm. Everyone who has one (including me) raves about them and how nicely they apply both paint and clear finishes like polyurethane. It’s not cheap by any stretch, but a cordless sprayer with easy clean up is definitely a game changer. Now you have a great list of Christmas Gift Ideas for Woodworkers. Go out there and buy that special Norm Abram in your life something that they’ll love! And if you’re still looking for more gifts for woodworkers than check out My Tools page where I list out a lot more of the actual tools I use in my shop.